The only system that provides continuous water, continuous cleaning and the joy of continuous grinding! The Aqua Flow System proprietary brush bristles transfer water from the reservoir to the grinder bit continuously, requiring the addition of water only at the onset of grinding. Conventional sponges suffer from sludge build up, making it necessary to clean the sponge. The Aqua Flow System’s anti-clog technology allows water to flow continuously, drawing sludge away from the grinding bit. With conventional sponges, water needs to be added every 10-15 minutes. With the Aqua Flow System, the brush bristles do not absorb sludge or dry-out, eliminating the need for constant cleaning and hydration. The proprietary brush bristles constantly clean the grinder bit while supplying water continuously. This feature maximizes the life of the grinding bit, ultimately saving you money on replacements. 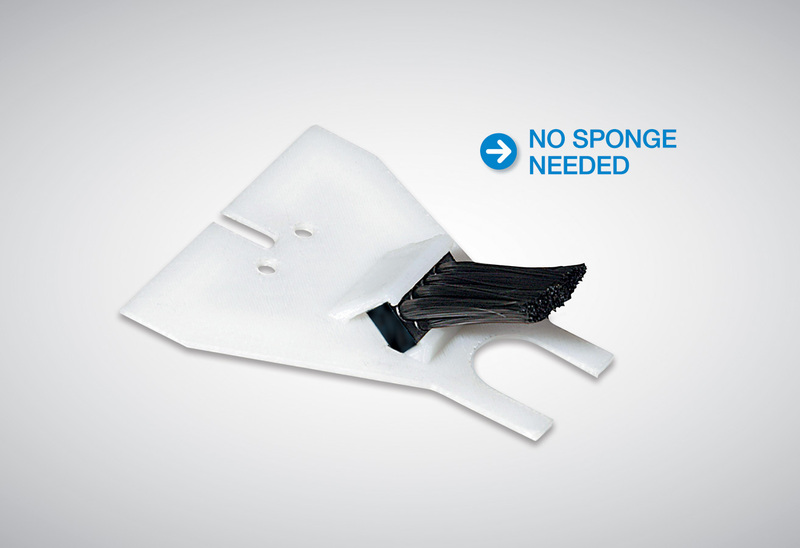 Once the self-locking snap-in holder is inserted, it will not detach as conventional sponges do. At the onset of grinding or when the grinder has been idle over an extended period of time, splash a few drops of water over brush bristles. This will hydrate brush bristle to commence grinding. 3. Install or ensure Quick-Fit Bit® or conventional grinder bit is locked securely on grinder shaft. 4. Slide brush through track on the Aqua Flow System holder. 5. Snap in self-locking Aqua Flow System holder between grinder shaft and reservoir back wall. Brush should touch grider bit. 6. Fill reservoir with water. a minimum of 1/8″ of water must be maintained for Aqua Flow System to operate. 7. Align grid opening over the Aqua Flow System’s brush and grinder bit. Set in place. To maintain optimum performance of your Aqua Flow System, periodically wash brush and holder with warm water to remove excess debris.